Today is five years since our daughter, Sarah, was diagnosed with Transverse Myelitis and it still feels surreal to all of us. Sarah was born with a genetic brain disorder that causes global developmental delays and in consideration of that she hit all her milestones late. Each milestone was a huge accomplishment and we celebrated along the way. Our family uprooted and moved from South Florida to Central Florida, so Sarah could attend an inclusive pre-school like none other. She thrived and eventually walked around 36 months. Late, but we were thrilled beyond belief. Although Sarah is non-verbal, her gestures and personality speak volumes to those that know her and instantly love her. As we expanded our family, adopting our two young sons, she continued to progress with her gross and fine motor skills, albeit delayed. We enrolled her in a mainstream school, in a resource room and she was the light of her class. Fast forwarding to our precious girl’s most difficult day on November 18, 2011. A normal school day for all the kids; Zach, 11 (now 16), Charlie, 5 (now 10) and Jeremy, 3 (now 8). We were both practicing attorneys and had lots of nanny support. I was headed out the door to litigate a custody trial and hoping to win custody for a dad of two young girls. Jason had child drop off duties and then he was off to work. Just prior to leaving the house, in the morning chaos, Sarah walked from her room to ours to greet us with good morning. As she approached the kitchen area, she began to gesture downward towards her feet and we were trying to figure out what she needed. Maybe she stepped on a bee? Maybe she twisted her ankle? Maybe she stepped on a hair bow? I left the house in a fury off to court and dad, Jason, off to drop the boys at preschool and then within 10 minutes, Sarah’s nanny called to say that something was seriously wrong, that Sarah had collapsed in front of the couch. I learned of this as I was walking into the courtroom and Jason rushed back to meet the nanny at the house to go to the hospital. My head was spinning with thoughts, but I had to focus on my client. Hours go by and no text updates from Jason. Lunchtime arrived and Jason said, it’s not good. How could it not be good? How much worse could this child be affected physically- she already had a genetic brain disorder. 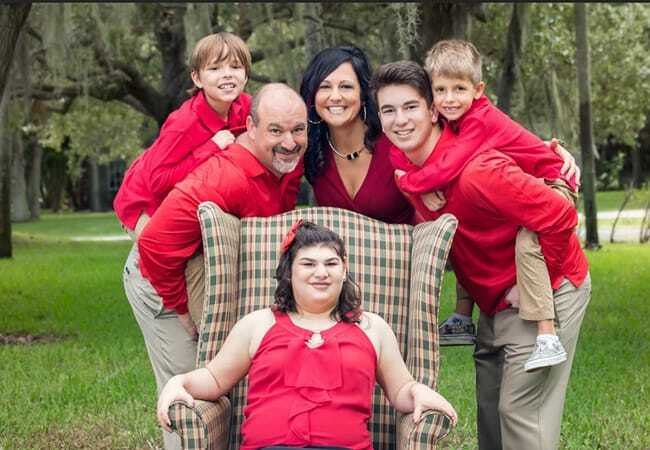 By 3:30 that afternoon, the doctors at the local hospital had an idea that it might be Guillain-Barré Syndrome or something related and started her on steroids, but in order to get a more detailed idea, they wanted to transfer her to a bigger hospital in Orlando. The hours and timeline now start to get blurred as I think this is when shock was starting to set in. There was a spinal tap, MRI’s and a final diagnosis of Transverse Myelitis. Transverse Myelitis? What the heck was that and was it related to her brain disorder? No. They told us No. It was not possible that God would strike this child twice with a crippling disorder. Sarah is a fighter and began yet another physical battle; the entire time smiling and hugging nursing staff. We continued to play the same silly games with her that we always did, we still whispered the same jokes to her, and we weren’t really sure how this was going to change her life. After 3-4 days in the hospital, the staff was ready to dismiss her. “She may or may not walk again; you need a wheelchair and need to start physical therapy pretty soon, Good Luck,” were their parting words. A wheelchair? WHAT???? We avoided a wheelchair her entire life! And so the vicious cycle of emotions began. Shock. Anger. Confusion. Helplessness. Why her? We went into full rehab mode and decided despite her inability to walk, we were not going to let the happiest child on Earth become lost in this new challenge. Happy is what she was and Happy is how we needed to keep her. Abundance of Love has always been our motto and now it needed to pull us through. I don’t think we ever grieved; grieving appeared sad. There would be no sad around Sarah. To this day, despite the hours of endless PT, additional medical care and modifications to her life as an ambulatory child, she still remains the happiest and most loving child. Our final determination is that God has made this child an angel warrior on Earth, brought down to teach us and everyone around her that life is about struggles and the only way to power through those struggles is LOVE. Love overcomes all. We can all learn from Sarah.